I have been a busy girl in the Sewers Bordello! I’m at the under 40 days mark for the annual fall Disney Trip and trying to get the last of the mouse sewing done. You know I’m not a big tourist t-shirt gal- I prefer a frisky top and some capri pants for my mouse trips, then at night I give mickey a little leg with a sun dress and my clompy sandals. So this is the 2nd to the last of my new duds for Mickey. Mccalls 6604- a pattern with many wonderous options. I am intrigued by a cowl with a collar, that could happen for fall- right now I’m sporting the little…what are they? They aren’t sleeves, they aren’t lovely shoulder awnings, they just allude to sleeves, actually. Perfect for Disney as I elbow my way past children to get to Beast before they do! “Get back, kiddies, I’m full of over-priced snacks and on my way to Dumbo!” Look! I sparkle! I made no changes to this pattern, I didn’t even take it in much- door to door it was a 3 hour event. *Now that time includes, checking on that noise that sounded like a cornered cat, scrolling thru the premium channels looking for Colin Firth movies, dropping the bobbin box, etc. You know, the usual sewing folderol at Palazzo Barnes. In case you can’t see them, I am wearing cheetah ballet flats to complete the ensemble- a butterfly cheetah combo! 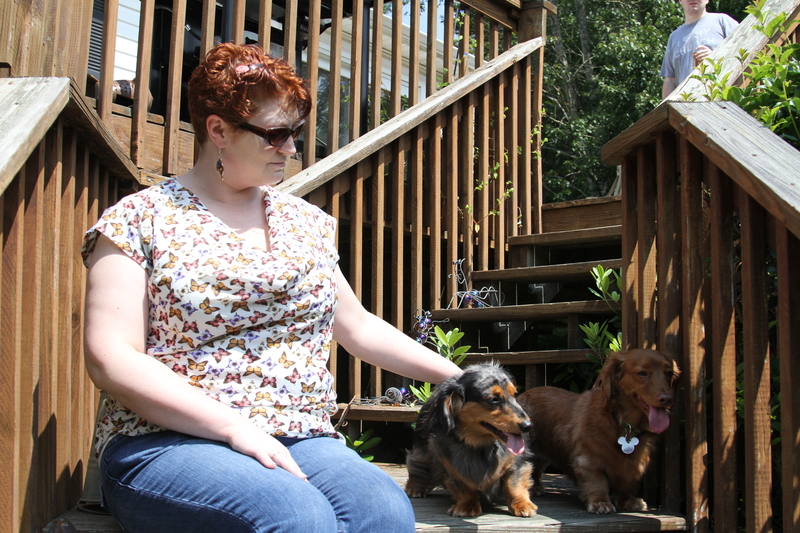 These pictures are from our afternoon at the Mominlaws house- the dachshunds ran their little legs off on her 2 story deck. they love Grandmas house- they ran thru her many acres and drank from her many toilets. Good times. Good times. 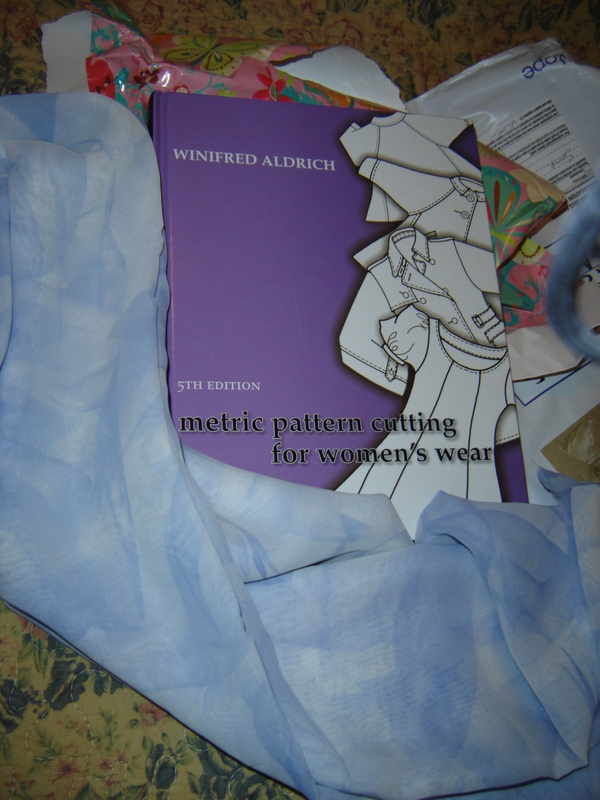 I’m so glad that I got my special prezzie from Anne this week- Before I head to Mouse house- I hope to read it and make copious notes during the lengthy drive- now that would entail willpower to wait, so I’ll bet you’ll be hearing about my time with Winifred Aldrich long before then! 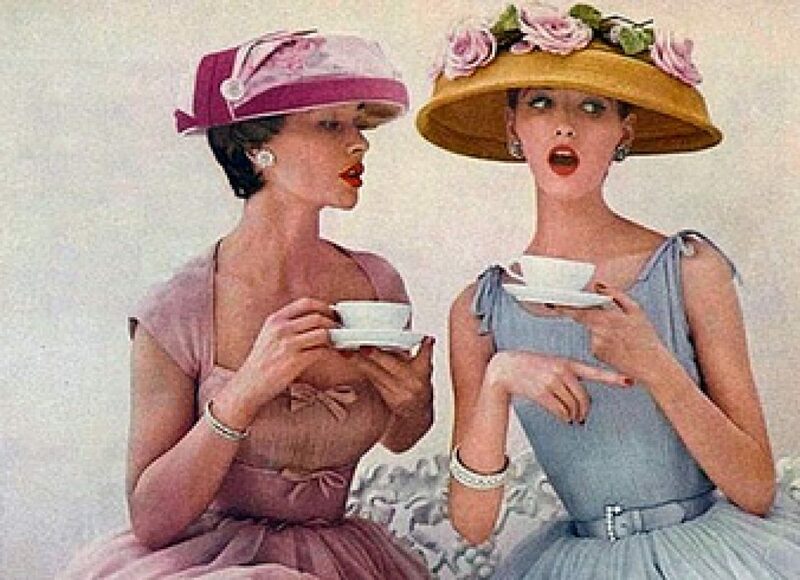 I should be drinking tea for that, don’t you think? I think that Bruder and I should we wearing lacy fichus and using a lorgnette while we read. Ok, that could turn into Bruder eating his fichu and Liesl burying his lorgnette, but we shall try to maintain the appropriate dignity it deserves. Did you note the fabulous length of silky, cloudy blue? I am loving that!! I don’t know what it’s fate holds, but I just want to wave it and prance Isadora Duncan style, you know? If you don’t routinely tune in to Anne’s blog- Mercury- Handmade Fashion she is very skilled and shares much knowledge, [please do – you will enjoy! Love the top – great for a nice summer / spring day. The dashies look like they have worn their furry little selves out – bless them. The tongues were hanging very low most of the afternoon! This is one of my favorite tops of yours. It really looks good on you. Awesome print. Love the balcony pose too. Important question–Did you find a Colin Firth movie? Actually- the Importance of Being Earnest was on! I love this top. Have had the same pattern out for a while, hoping to make one soon. Hope you enjoy your trip 🙂 This is a good choice. I really want to try every option on this pattern- got to work on my bias tape skills! Sometimes Hancock is good to me! You always make me smile and I leave your blog with a smile on my face. Just wonderful. Wishing you a wonderful holiday and hoping that you teach those tourists a thing or two about how to really dress. Cute top by the way. The perfect flirty top for seducing Mickey! I hope you have a wonderful trip, and good luck on the seduction thing! Oh Minnie has no idea whats coming!! 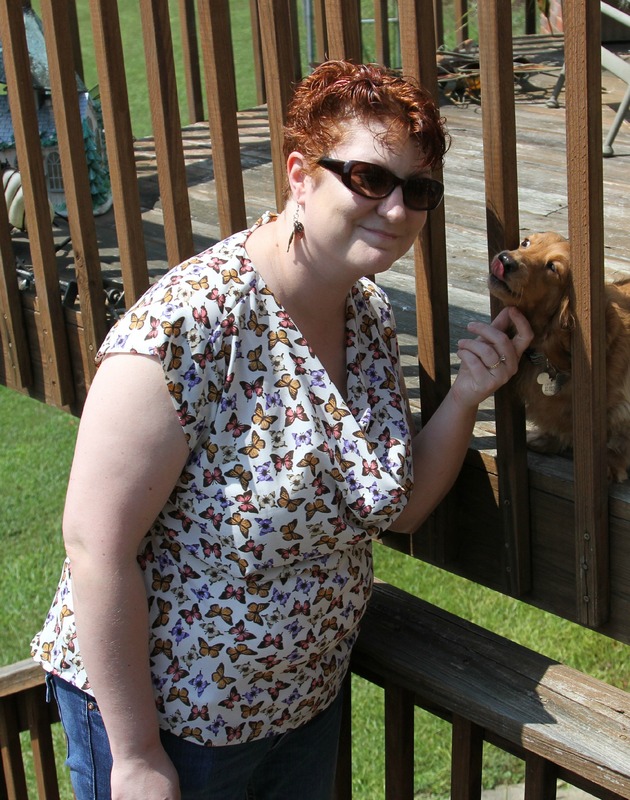 That is a cute top, and such a cute pic with your little dog! It’s not even too flippy- it stayed put very well. So pretty, love the cowl! Couldn’t help but think of “butterflies are free to fly, fly away…bye, bye!” as you take off from ma-in-law’s deck in full flight!! Another hour there and it could have happened…. Such a nice top and quite flattering! I love those drapey front blouses myself, although the collar thing really kind of threw me off. You’ll look dashing next to Dumbo! On NO! Running ones legs off will never do, especially when there isn’t too much to begin with. The pair is looking dashing as always. Poor Liesl got an allergy attack and was all red and sniffy the rest of the weekend. She had to don a sweater soon after! Such a cute top! I recently bought this pattern now its bumped up my to-sew list. Also I love the way you write, so fun! it’s so easy- sometimes you just need a go-to win pattern, right? You’re very sweet! I never noticed this pattern before, I’m going to have to pick this one up. It is very pretty (the fabric too) and perfect for the magical kingdom. The cover is very annoying with the ‘shuffle board, trying to play twister’ poses- I almost didn’t buy it! A cowl (my favourite), butterflies (another favourite), cap sleeves ( ‘nother fave) cute little doggies ( yep nuther one) and disney! (yay!). Very stylish too. speaking of mr. darcy, i mean colin firth, have you seen fever pitch? cute, and lesser known. also, i saw him in a film which i really enjoyed but i can’t recall the title…he may have been recently widowed, he was a writer, rented a place in italy…i’m missing most of the plot, but it was a great firth-vehicle! we just saw tinker tailor soldier spy this weekend, and it was a lovely surprise to find him in it. yum! I loved Fever Pitch- the husband is a huge football fan, so we were able to bond over all things Arsenal and Firthy! He found it very insulting when they made an American version with baseball. So wrong! That is such a great movie! oh shoot, was there a scene in love actually where his stack of typing blows into a lake and he and his housekeeper dive in to save it? i’ll be embarrassed if it’s love actually as i’ve seen it so many times! You were distracted by Bill Nighy’s leather suit- totaly understandable! and that was after being distracted by alan rickman, too! three of my crushes in one film! thanks to both of you for not berating me for that inexcusable mistake. Oh I could talk about that movie all day! now that we’re off on a tangent…that scene where emma thompson opens her gift to find the joni cd breaks my heart in pieces. every time. 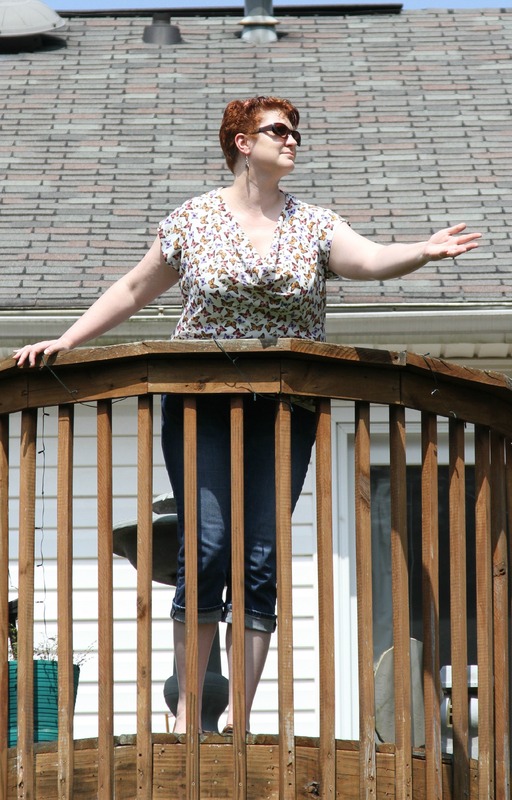 Awesome new top, and I love how you are Eva Peron-ing it up on your MIL’s deck! You got! I was totally patti luponing my heart out, much to the nephews amusement! Your butterfly fabric is just so much more attractive that using a plaid and having the lines go all wonky. The fact that it states it has forward shoulder seams, always good for real women makes it fit better than skimpy backed patterns. Interesting that only the front is cut out on bias on one version.Minnie will not know what hit her! I thought that the cutting out was interesting- I’ll have to look for more forward shoulderly stuff- it really is quite a comfortable top. That’s a cute top, and I’m liking the idea of adding a collar.. hmm Glad the parcel arrived all in one piece, enjoy making notes! The first time I read my now rather battered copy I made a loooong list of all the patterns I wanted to try! Have fun at Disney! It’s a great book! I’m so thankful to you! Love the top! I was intrigued by the pattern when I first saw it, and I’m loving how your version turned out! Have an amazing time with the mouse – the park will be so fabulously decorated while you are there! I love the fall decorating best! I love the term “shoulder awnings”- lol! Your blouse looks great. I love the butterfly print.